During the first half of 1974, a number of Twin Cities area members of the auditing profession became interested in forming a local chapter of the EDPAA. One group of four men attending the second Annual National Conference in Chicago met, agreed to form a chapter, and obtained from Cliff Perkins a chapter formation package which detailed the steps to be taken. One of the requirements was a minimum of eight people necessary to form the chapter. The national office of EDPAA notified this group that another group of three men, plus another man from this area had asked the national office about chapter formation. These eight men became the nucleus required. Our application for chapter formation was sent to national headquarters of EDPAA and accepted At this point the committee scheduled an organizational meeting to be held at the Farmers & Mechanics Savings Bank in January of 1975. A notice to this effect was mailed to everyone in the Twin Cities that we knew would have an interest in a professional organization committed to the promotion of EDP auditing. Attendance at this meeting was approximately 25 people. Paul Norris was selected by the chapter formation committee to chair the organizational meeting. The response from those attending was excellent and all recommendations made by the committee were accepted. The slate of officers nominated by the committee was elected and a number of people present volunteered to serve on the various new chapter committees. On February 11, 1975 the Minnesota Chapter was formally accepted by the EDP Auditor's Association.The first monthly dinner meeting of the new Minnesota Chapter was held in February, 1975 at the Holiday Inn near the airport. Dr. Gordon Davis was the after dinner speaker and attendance at the meeting was about 55 people. Marv Remus came to the meeting as a representative of the national organization and welcomed us as the seventh chapter to be formed in the EDPAA. The March, April and May meetings were held at the Ranch House and the Registry Hotel. At the May meeting Paul Norris was re-elected President for the 1975-1976 chapter year. In June, 1975 a number of Minnesota Chapter members attended the International EDPAA conference in Philadelphia. Frank Drey served as the representative from the Minnesota Chapter and attended meetings held for the chapter representatives. At one of these meetings the chapters were asked to make presentations for future International Conferences to be held in their cities. 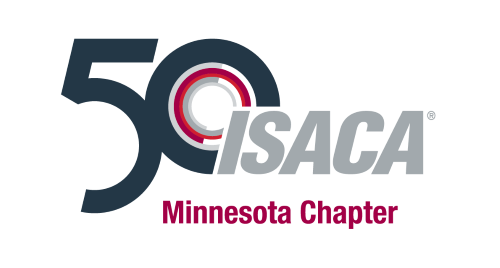 Frank and Paul Norris had decided earlier that the chapter should make an earnest effort at this time to secure the conference for the Minnesota Chapter at a date two or three years in the future. Since the chapter was only a few months old at the time it came as a shock to both Frank and Paul when the national organization accepted our offer for the 1976 Conference. Frank was appointed International Conference committee chairman and quickly formed a group to handle all the details. Since there was less than a year until the 1976 Conference, selecting a site had to be assigned the highest priority. A decision was made to hold the conference along the 494 “Strip” rather than either downtown Minneapolis or St. Paul. Of the motels large enough to handle a conference of this size, and not yet booked for the time period, the Marriott Inn was chosen and reservations made. The International Conference was held at the Marriott in Bloomington on June 24, 25, 1976. The conference fee was $125.00 for members and $155.00 for non-members. The conference was attended by approximately 350 people interested in EDP auditing. The featured speaker was Rep. Barry Goldwater, Jr., who spoke on “Privacy Legislation Affecting Private Industry”. The conference was a complete success and provided the seed money necessary for our chapter to provide quality seminars and monthly programs. On November 3, 1983, the Minnesota Chapter became incorporated as a Nonprofit Corporation in the State of Minnesota. The Minnesota Chapter earned the 2007 K. Wayne Snipes award for being the Best Very Large Chapter in North America. The Board of Directors would like to thank everyone who helped our chapter achieve this award. The award was formally presented to our chapter at the 2008 Global Leadership Conference, held just prior to the International Conference, in Toronto, Ontario, Canada on 25-26 July 2008.